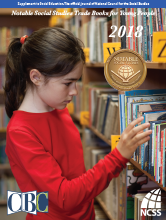 Click on the pdf link below to find a preview of the 2019 Notable Social Studies Trade Books list. The final list will include annotations for each title, as well as connections to the National Standards for Social Studies. The final list will be published in a 16-page illustrated pullout in the May-June 2019 issue of Social Education. The books that appear in these annotated book lists were evaluated and selected by a Book Review Committee appointed by National Council for the Social Studies (NCSS) and assembled in cooperation with the Children’s Book Council (CBC). NCSS and CBC have cooperated on this annual bibliography since 1972. See Notable Trade Books for Young People Lists from years past, which are open access; the current year is NCSS member access. Publishers’ names appear in abbreviated form; complete names and addresses are available in such standard reference works as Literary Market Place (Bowker) and from the Children’s Book Council (CBC). Titles are arranged by broad subject categories and subthemes. Although many are appropriate for more than one subject category, they have been placed where their usefulness in social studies education appears greatest. Annotators have also indicated the thematic strand of National Curriculum Standards for Social Studies to which the book relates. Although many titles have multi-strand applications, space restraints dictate including a maximum of three strands per title. FOR PUBLISHERS WISHING TO SUBMIT A BOOK: CBC receives submissions beginning in June (for books published the previous year). Check for updates at www.cbcbooks.org/notable-social-studies.